If you notice something that may be damaging your fiber cables, be sure to give us a call to come fix it! Protecting your fiber network is essential to providing consistent, quality service to your clients. Especially if you have aerial fiber, you have to protect against many different threats to your fiber cables. Here are a few things to watch out for and how to protect against them. Many animals seem to have a fascination with cable, which often results in the cable being destroyed by birds, rodents, or insects. To protect against this, keep an eye on your cables and watch out for tampering. You may be able to catch and fix a problem, like a termite infestation in a pole that supports the cables, before it affects your business. Fiber often has to bend and twist around tight areas, fit through small gaps, and share space with other utilities. 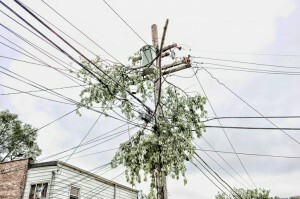 This stress upon the cables can result in the fiber cables being crushed or bent beyond their tolerance, leading to fiber network failure and the need for replacement. To prevent this, we can use rugged/crush-proof cables that have a small bend radius and can easily fit around obstacles in its transmission path. You can also decrease the amount the cable has to bend by removing unnecessary obstacles, like rocks and stones in an outside trench. Spotting environmental damage can be difficult. Sometimes environmental damage comes from a weather event like a big storm or hurricane, but more often than not it comes from extreme and rapid temperature changes. Weather and temperature changes puts strain on the fiber network and can even impact your network’s performance. To protect against this, we use quality fiber that is more resistant to environmental changes. This entry was posted on Monday, June 6th, 2016	at 5:37 pm	. You can follow any responses to this entry through the RSS 2.0 feed. Both comments and pings are currently closed.